Known as one of the most renowned abstract expressionist in the history of art, Willem de Kooning has influenced numerous artists during his time and even years after his death. In 1920 de Kooning became an assistant to Bernard Romein, art director at a large Rotterdam department store. Romein introduced him to the work of the Dutch modernist Piet Mondrian and the De Stijl group. De Kooning began to paint, although he apparently viewed the medium with a certain detachment, as he would note in retrospect in i960, "When we went to the academy [in Rotterdam, in the early 1920s] - doing painting, decorating, making a living - young artists were not interested in painting per se." Painting, in de Kooning's eyes, was something "for men with beards," that is, nineteenth-century greats, such as Cezanne and Monet. The idea of equipping himself with a palette and painting pictures seemed ridiculous and quite unmodern to him. 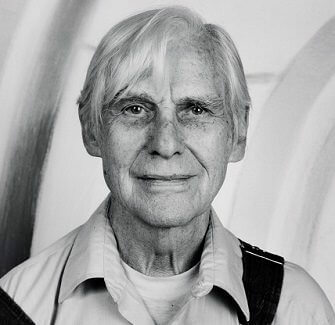 During that period de Kooning pictured his future in the field of applied or commercial art. A career in decorative painting or design were the options he considered. His later decision to emigrate to the United States would be strongly influenced by this goal. 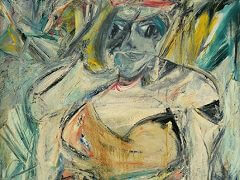 As de Kooning would say years later, painters flocked to Paris, while "a modern person" was attracted to America. Despite envisioning a career in commercial art, de Kooning became deeply involved in painting. The ideas of the European avant-garde, foremost those of Wassily Kandinsky, Paul Klee, Matisse and Pablo Picasso, would become an essential foundation for his own development. 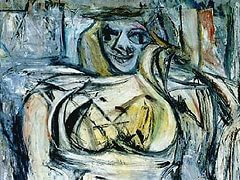 Picasso especially developed into a key source of inspiration for de Kooning's early work. A meeting with Arshile Gorky, whom de Kooning got to know by chance in 1930, marked the first decisive turn in his artistic career. 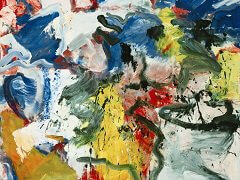 Inspired by Arshile Gorky, he decided to create a series of paintings that featured male subjects. These artworks included Seated Figure and Two Men Standing. Aside from being Seated Figure and Two Men Standing. Aside from being fascinated with these themes, he also made some abstract paintings including Elegy and Pink Landscape. His love for abstract art moved him to create more masterpieces such as the Pink Angels, which was among his well-loved paintings. In 1942, Graham would mount a group show, "American and French Paintings", at the McMillen Gallery. This key show included works by de Kooning and other American artists, alongside those of established Europeans such as Joan Miro, Picasso. 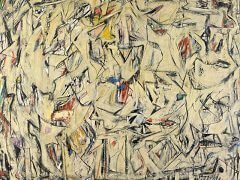 It also led to the first meeting of de Kooning, who described Graham as his "discoverer" and Jackson Pollock. His love for black and white enamels started in 1946, as he barely had enough resources to buy professional artists' pigments. Despite that financial concern, he was able to produce fine artworks including Black Friday and Light in August, which included black and white elements. As for his other masterpieces entitled Mailbox and Zurich, these were largely white with a hint of black. 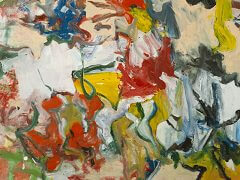 It was also during the late 1940s that he began to paint more complex abstract works. These included Attic, Excavation, and Asheville. Beginning the early 1940s, de Kooning often made use of women as his common subjects. However, it was in the 1950s when he became more fascinated with presenting women in his artworks. In fact, among his finest works included Woman I, which was on exhibit in new York's Museum of Modern Art. This painting has undergone numerous changes until it was completed fully in 1952. By 1953, he continued to present women in most of his paintings. These artworks were on display at the Sidney Janis Gallery, and his masterpieces became somewhat of a sensation because of his use of imagery. 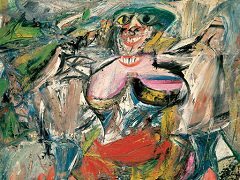 For instance, he experimented on aggressive brushwork, and he focused on putting greater emphasis on certain areas in his paintings such as large breasts, exaggerrated extremeties and other features that revealed a man's typical sexual inhibitions. 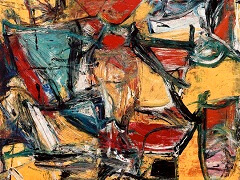 The explosive nature of de Kooning's work tells us that it is an art of struggle, that its source is both painful and personal, obviously based on feeling over intellect and very probably stemming from some "primal event" (as Sigmund Freud might term it) in his early life, or series of events, so traumatizing that the artist was forced to thrust them into his unconscious, and has spent a lifetime trying to keep a lid on them, only to have the unconscious contents violently erupt countless times in his paintings. 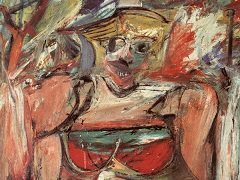 By the early 1960s, de Kooning began to combine women and landscape as his subjects. Moreover, he began to explore his fascination with sculpting, which led him to create a total of 13 clay s culptures that depicted women as the subject, just like in his paintings. During his life, woman figure is a motif that de Kooning always returns to, as artists have always returned to their beloved themes - Van Gogh his Sun Flowers, and Claude Monet his Water Lilies. In the 1980s, de Kooning became quite active as an artist, which led him to create over 300 canvases. However, he began to show signs of health issues such as dementia symptoms. In fact, he was diagnosed to have the great probability of developing Alzheimer's disease. When his wife died in 1989, his daughter and his lawyers were assigned to have full guardianship of the aging artist. Throughout the life of de Kooning, he was able to reap numerous achievements in the field of art. One of his first accomplishments was when he had a first show in 1948, at New York's Charles Egan Gallery. Several of his works were also on display at the Whitney Museum of American Art, National Gallery of Art and the Museum of Modern Art.